Here are some tips on keeping dresser tops, counter tops and other surfaces clear of the piles that tend to accumulate. These are known as Clutter Hot Spots! Evaluate, adjust and Smile! You did it! Strategically place knick knacks on a Clutter Hot Spot. A good place for this would be a bedroom dresser. If you had piles on it and now it’s clear, chances are you might start dumping stuff there again. Maybe you like the newly cleared and minimalistic surface but it is not likely you will maintain it. It would be easier to maintain order by setting up some sort of display on the surface, like photos, souvenirs, or items given to you as gifts, made to look nice and act as a deterrent for dumping. Decorative Trays can be useful. Put a few knick knacks on a decorative tray and put the tray on the surface so the display can be moved easily. Another good way to utilize a decorative tray is for corralling items someone is using near the clutter hot spot. 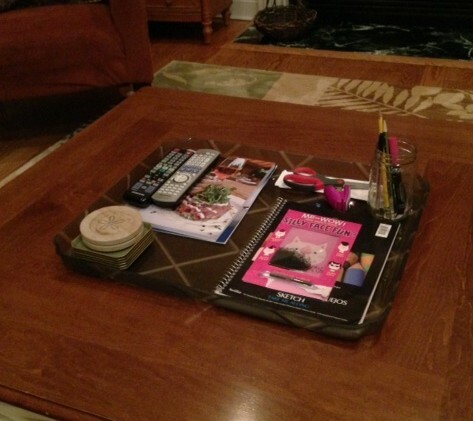 For example, the large coffee table in my family room is where my daughter works on some of her art projects. The items are kept on a tray instead of across the entire table. Keeping a few items on the tray keeps the inventory smaller and more reasonable, and when it’s time to dust the table, the tray of items can be removed quickly. It really doesn’t look cluttered. It doesn’t look catalog perfect either, but that’s ok because people live here! Eliminate Some Inevitable Clutter Hot Spots Altogether. I’ve been in many homes where certain chairs, benches and stools are not used for seating. They’re used for catch alls. I suggest eliminating those chairs all together, at least for a while until that habit is broken. Defend against “The Dumping Ground”! One kitchen counter in my home is the inevitable dropping area when family members come in. It’s natural to have one in the home. It may be natural to have a number of them but I only allow one. J As long as we address the items that land there once a day, it only takes 5-10 minutes to completely clear that spot. It’s really not bad! As a Mom living in a busy household, I’d rather allow one spot as a quick landing spot and address it a few minutes daily than allow the whole house to be treated as a dumping spot and get frustrated with it all. This does not include mail. Mail is sorted immediately upon entering the house and junk mail is discarded right away. In many homes I work in, people hold onto empty boxes. Fill the boxes with donateable items and give them to charity! Do not accumulate so much stuff. Shop based on need. Live resourcefully, knowing you are able to get what you need when you need it, and don’t overprepare unreasonably. Do not slack off on the above tactics and start cutting corners. Every corner cut makes the next one easier to cut. Periodically weed thru areas, letting go of obsolete items and ones taking an unreasonable amount of valuable space. If you would like to receive other posts in this blog series, please visit www.jeanlinderorganizing.com, Go to Contact Me and send me a message. I will email you past and upcoming posts! Jean Linder is a Professional Organizer working in homes and offices throughout Suffolk County. Well already everyone know of that http://genericcialis-online.biz found with ease in the Internet. In special on our website it is full of it. But you forget and constantly you ask.